This Is Your Captain Speaking: So Who Flies Into a Hail Storm? The short answer is nobody does this on purpose. 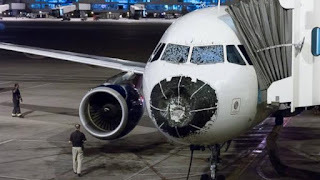 This past Friday, a Delta A320 with 125 passengers and five crew was enroute from Boston to Salt Lake when it ran into some hail near Denver. The aircraft was heavily damaged and diverted into Denver. There were no injuries other than some passenger anxiety. The problem is, hail is more or less invisible until you run into it. Being dark at the time of the incident didn't help either. The other problem is that hail doesn't just come out of the bottom of clouds but can be ejected from the top of some larger storms. Large thunderstorms are maelstroms of updrafts and downdrafts. When hail is caught in an updraft, it can be thrown out the top of the storm for dozens of miles. The airplane was cruising at 34,000 ft and likely well clear of the storm when it was hit. I'm amazed every time I see a photo like this that the hail damage isn't much worse. The airplane, after all, is traveling close to 500 miles per hour. Anyone who's ever ridden a motorcycle can attest that simple rain drops at 60 mph are painful. Imagine chunks of ice at 500. The fact that the windows were cracked but structurally intact is a testament to the engineering which goes into their design. A complete windscreen failure would mean a high probability for loss of the aircraft. Rest assured, dear reader, that those windscreens are designed to take a lot more abuse than some hail can dish up. Their design specifications include hitting a large bird such as a goose at a very high speed. Special cannons are employed to shoot bird carcasses at windscreens during certification. The windscreens are a multilayered laminate which includes a heating layer embedded in the glass to keep it from becoming brittle. Even if one of the layers appears shattered, the load bearing layer most likely is not. I even had a windshield shatter about a year ago for no reason at all. We were at 41,000 ft minding our own business when the windscreen just spiderwebbed with a resounding crack. After a few tense moments, we determined that it was not the load bearing layer that had cracked. We landed at our original destination (it was the closest airport) and I doubt the passengers knew a thing because we didn't tell them. There's no reason to unnecessarily scare anyone. The bashed in radome on this jet also looks alarming, but it really isn't. The radome is plastic and is designed to be transparent to radar signals. The airplane will actually fly just fine even if the radome is knocked completely off. The noise level up front may increase and the radar antenna itself may be somewhat worse for the wear, but it isn't any super big deal. Hail going into the engines, though, can be a potential problem. If the hail is severe enough it may bend or break some of the inlet guide vanes or compressor blades. Again, this is unlikely, but possible. Those engines are also tested by having birds and hail fired into them while running at full power. The cowling of the engine is also designed to contain any flying parts from hitting the fuselage. Probably the largest challenge these pilots faced other than cleaning out their britches after the hail first hit, was landing the airplane with an obscured view through the damaged windscreen. The truth is, even that could be mitigated by using the airplane's instruments. Aircraft instruments, after all, are designed to allow pilots to land in low or no visibility. They might even have used the airplane's autoland capability. 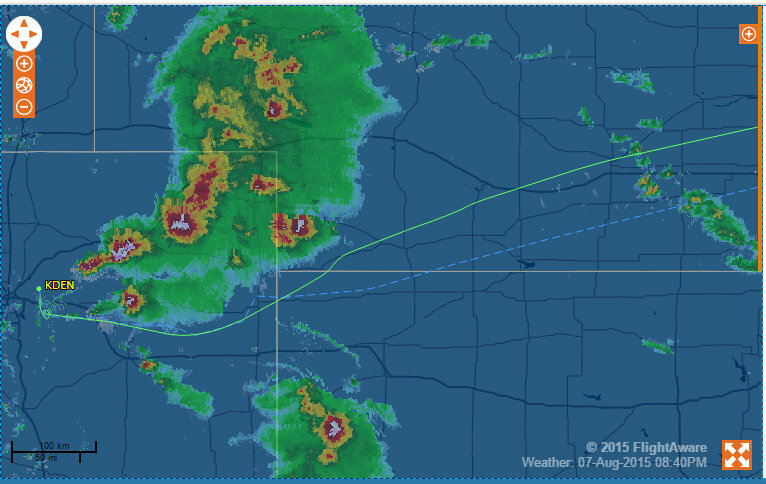 Can't Pilots Just Steer Clear of Storms? Well, they can and do. The FAA publishes guidelines for the avoidance of thunderstorms to which all airlines must adhere. The guidelines state that above 23,000 ft, all radar echos must be avoided by more than 20 miles. Pilots also know to avoid detouring around a storm on the downwind side because if hail is thrown out the top, the wind is likely to carry the hail to the downwind side. But even with all those safeguards, occasionally an airplane will run into some hail. Thankfully it doesn't happen too often, and when it does, the professionals up front know how to get the damaged beast safely on the ground.